Black metallurgy from Québec, Gevurah is audible alchemy for the sulphur soul – employing formulas of the past to channel through music the transformation within. Also featuring an exclusive stream of the new MLP. – GEVURAH is all about exploring the darkest and most sinister aspects of the soul. It’s a musical expression of will – both to become creators in our own right and freeing ourselves from Demiurgic light, hence why we took the name of the sephira of separation, strength, and judgment. Not just creating for the sake of creation or, as is often the case, mimicking what others have done, but really exploring what hides within and through a cathartic experience become one with these forces and let them speak through us. Darkness and light are constantly intertwined within ourselves and the deeper we plunge into such depths, the more intense the emotions that come alongside either afterwards or during. That’s why, as you may have noticed, our songs always maintain a certain balance of darkness in the shape of dissonance and light manifested as melody. 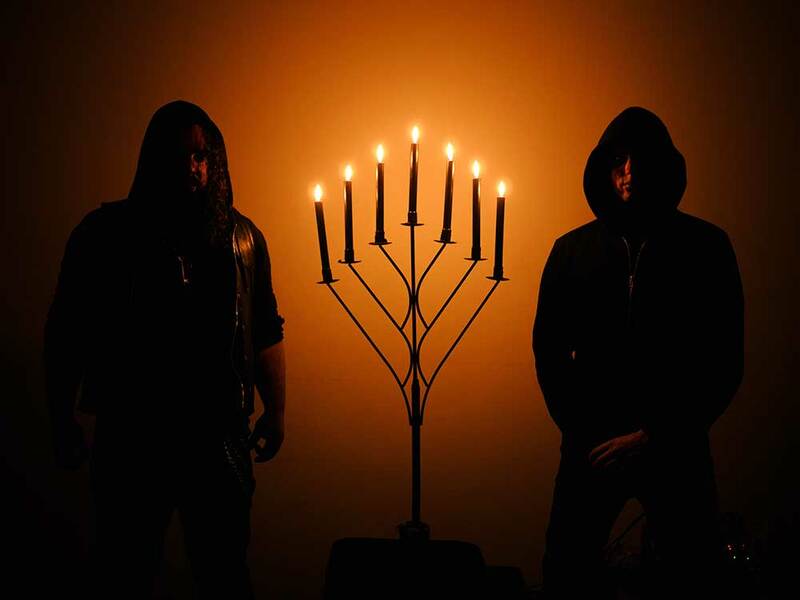 The inception of the new MLP, which is set for a September 28 release via Profound Lore Records, took place shortly after GEVURAH had recorded their 2016 debut album, “Hallelujah!”. – Basically, for a multitude of reasons, that material was written pretty much entirely by X.T. (vocals, drums, guitars) without any rehearsals during the composition process. Once the album was finished, we sought a return to the manner in which our 2011 demo and the “Necheshirion” EP (2013) were created: as a joint collaboration. After the rather exhaustive journey that was “Hallelujah!”, we went for something more ferocious, primal, and instinctive – coming from the heart while retaining the essence and spirit that’s central to all that is GEVURAH. While the actual music for this release was written in a short amount of time, to maximise its potential we invested significant efforts into arranging and rehearsing the songs. 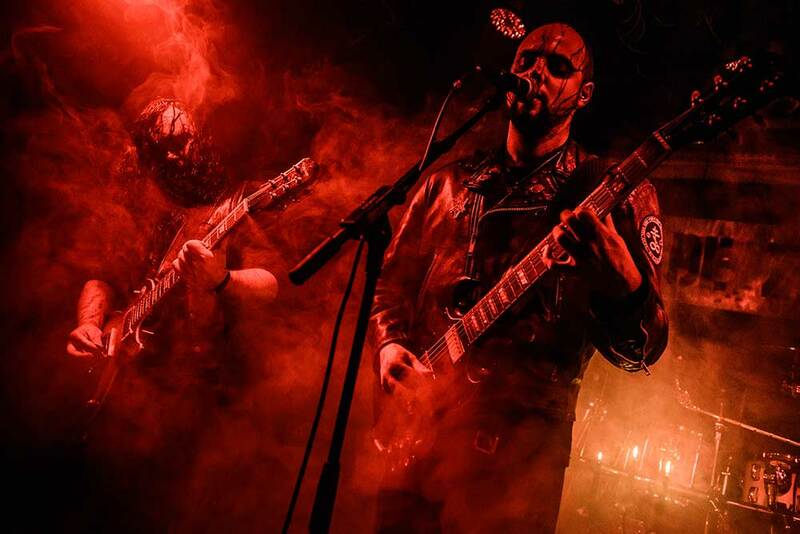 In March 2018, GEVURAH performed a small European tour consisting of four dates. – Honestly, it was a very intense experience. The first date was at Hell over Hammaburg in Germany at 4pm; we were completely sober – a duly noted error – and besides MASTER’S HAMMER, we were playing with only heavy metal bands. This caused the show to be quite a challenge, as it was very difficult to channel the right energy. However, the next day was in France where we played a small DIY fest with our good friends in ARKHON INFAUSTUS, RITUALIZATION, and a few others. We got into a fight with some idiotic Germans backstage so tensions were pretty high the whole night. But it was a really powerful and intense show and at this point we realised that this is where we truly belong: where chaos lies dormant and can awaken at any moment. I’m wondering if GEVURAH indulges in the typical on-the-road hedonism which tends to define most such ventures. I’ve heard plenty of esoterically engulfed musicians who claim to meditate, astrally project and whatnot whilst on tour but have personally never witnessed anyone do that. – Sure, we did our share of drinking, if you can call that hedonism – mostly fancy French wine and cheap German lager but nothing really out of habit. Spiritually speaking, each individual has their own way of preparing before a show. Those who’ve seen us know how we begin every live performance: we light some candles and incense and then carry out a simple ritual in order to invoke and focus the right energy, both our own and that of the audience. So far, this has proven to be the proper way of doing things. Our religious practices are deeply personal, we each interpret the voice of the numinous in our own way and feel no need to participate in any grandiose rituals either backstage or on stage. We let our soul become a channel to the Sitra Ahra and this requires no Halloween decorations or multi-stepped rituals. We make do with what we have and create our temple on stage by letting what’s within come out. Speaking of décor – inspecting photos here, is that a menorah you have on stage? – The three and seven-headed candelabras we use have nothing to do with any particular religious tradition but rather represent the various symbolism related to the trinity and the sacred. There’s already been a few people who’ve gotten annoyed with our Hebraic logo but that will certainly not prevent us from using symbolism we deem essential to GEVURAH. The title, “Sulphur Soul” – some might argue it sounds ever so slightly MARDUK-inspired. – Indeed, we’ve thought about the MARDUK reference; especially since “Opus Nocturne” is one of our favourite albums but, quite simply, this is the title which best represents our mini-LP. Sulphur is the active element that transforms the soul from an empty, dead vessel into one radiating with unbound light. Conceptually, “Sulphur Soul” deals with the four elements of the spirit: earth as represented by lead, water by mercury, fire by sulphur and air by gold or salt. It signifies our spiritual journey, from death of the ego to rebirth as purified entities with spirit and will unified – liberated from chains of the material world in this modern age of disintegration. This is a metamorphosis we ourselves are undergoing so it’s a very personal release, thematically speaking. “Sulphur Soul” contains four songs, representing the four phases of the alchemical process. There are several different interpretations of what the Great Work really practically entails; whereas some imagine the alchemists of old as physically attempting to change lead into gold – one heavy metal into another – others believe this notion to have originated as a metaphor for the refinement of human consciousness. As such, I’m curious whether GEVURAH merely study the philosophical concepts or engage in actual metallurgic work. – The traditional practice involving metals and such, no, but the spiritual one, absolutely. The alchemists of the Middle Ages are a perfect example of the saying, ‘The journey matters more than the destination.’ If they really were pushing the limits of contemporary knowledge to achieve transmutation of lead into gold – or discovering the philosopher’s stone – the objective wasn’t as much accomplishing those endeavours as it would’ve been reflecting the practitioner’s exterior actions through an inner transformation of the soul. It’s unclear how much they actually believed in the likelihood of physically turning lead into gold but if you read Paracelsus and other contemporaries, it’s clear that alchemy was first and foremost a work of spiritual elevation. The practice and its associated symbols are extremely powerful and reflect quite extensively the work required for one’s soul to achieve transcendence. The seven steps of purification and related concepts such as the material, animal and spiritual elements associated with them are very potent tools for any serious adept of esoteric practice. It could be added that the Great Work is applicable to all facets of life and this is precisely what we perform with GEVURAH; refining raw energy into a pure musical creation which strives to be of the highest artistic value. Therefore, we could say that yes, we are absolutely alchemists in our own way. So, would you call yourselves practicing occultists? – To be honest, we’ve never considered ourselves very much as occultists. Let’s say we’ve left the heavy studies of our beginnings to indulge in more routinely meditative exploration. Our practice is far more aimed at spiritual growth, knowledge, understanding, and – dare we say – transcendence. Therefore, while modern Left-Hand Path traditions such as Dragon Rouge, Order of the Nine Angles, and Misanthropic Luciferian Order were very useful in getting a good early grasp of what the dark arts held within them, we were never interested in becoming members of any such organisation. I’m honestly not sure why anyone who takes these things seriously would regard dabbling in something like the Dragon Rouge system without proper guidance to be anything less than a spectacularly poor idea. It strikes me as generally unwise to engage in any magical system without a firm understanding of the basics – practicing Qabalah without a rudimentary knowledge of Hebrew, for example. One would think someone who acknowledges an arcane tradition as authentic would also recognise and respect the perils involved with novice exploration without tutelage. – Absolutely, we do not consider ourselves as practitioners of ceremonial black magic and would never try an advanced ritual without the required experience or guidance – our approach is purely spiritual. Furthermore, we don’t really have any interest in group settings or being involved in an organisation. As for the use of Hebrew in the context of GEVURAH, it serves as means of staying as close as possible to the essence of the Word, seeking to turn it into a sigil. As you may know, there’s great strength in abstracting concepts to extract their essence. Consequently, using languages your mind isn’t used to and script you aren’t able to read at will is a useful and powerful tool. Besides Dragon Rouge, ONA and MLO were also mentioned – both of which are complex systems with very little in common. When spreading oneself so thinly, surely there must be a risk of reaching no deeper than scratching the utmost surface of the respective disciplines. Any technique with which to establish a connection to the numinous I’ve ever had the slightest bit of success with has been the result of daily practice spanning over months. Maintaining several disciplines at once must be ridiculously exhausting, not to mention time-consuming. – While we’re influenced by and interested in many traditions, it doesn’t necessarily mean we put all of them into practice. We may find certain symbols, rituals, or concepts that resonate with us and incorporate them either into our personal practice or musical output. Studying multiple subjects really broadens one’s perspective in regards to spirituality, which is why most serious modern teachings use symbols borrowed from multiple traditions – mostly Eastern mysticism, Qabalah and alchemy. Especially within the Left-Hand Path, where there’s no definite guideline or tradition, the more you experience the better you’ll be able to connect with your own soul and uncover liberating symbols, practices or concepts. The human spirit and its relation to the mystical is extremely complex and, in fact, impossible to truly capture with words. Therefore, the broader your perception is, the better you may be able to experience it and find your own way to connect with the divine. I’m also slightly puzzled by this theological pick-and-choose outlook, especially how it can be practically implemented in real life. For example, upon facing an important decision – does one run the notion through the various doctrines in one’s repertoire to see which platter from the spiritual smorgasbord holds best advice? Surely, a true believer must have certainty; if there’s not an unwavering belief in release from saṃsāra, it would be a frightful waste of time spending one’s life as an ascetic monk. – You misunderstand the nature of the influence of these multiple traditions, what you call the ‘theological pick-and-choose outlook’, over our belief system and approach. To put it simply, all these traditions are different facets of the same relationship – the human soul with God, the divine, or whatever you want to call it. Isn’t the ascension of the soul through death, purification, and rebirth the basis of any true spiritual practice? To take your example of saṃsāra, the cycle of perpetual rebirth of the soul, what does it mean to the core? Basically, it’s liberating the essence of your soul; ridding yourself of unneeded, useless, and often material or greedy impulses. To follow your True Will, so to speak, and ascend. How is that any different from the inner transmutation of alchemy? We don’t view it as a smorgasbord so much as a multitude of perspectives, each containing fragments of truth. With time and practice, these perceptions convene into a single honest and pure understanding of your personal connection with the numinous. What I still find difficult coming to terms with this is that a religion by its very definition must be regarded as divine truth. That’s what grants it validity amongst believers, even if the guidelines are nonsensical and contradictory. If one disregards certain aspects of a religion as incorrect, then surely the remaining tenets will crumble with it. – If certain commandments contradict each other, perhaps it’s a good time to question yourself on that religion and your approach towards it; and put it into perspective. The path towards transcendence, especially that of the Left-Hand practitioner, is filled with traps and hardships and it’s only up to oneself to overcome them. You can read as many books as you’d like and become a PhD in Black Magic Occultism if you wish, but if you don’t do the work yourself or indulge in disciplined practice – to shed light in the darkness within and reveal its secrets, you’ll never find the true meaning or purpose of these traditions. Therefore, you may find these contradictions to sometimes be far more revealing than they would appear. An omnium-gatherum of others’ systems can ever only be seeds in service to the disciplined cultivated growth of one’s idiosyncratic labyrinthine harvest in life.